These lamb burgers by Alison Needham are a unique twist on an old classic. Serve them at your next cook out with an icy cold (gluten-free) beer. Growing up in a one-horse town, I never did try too many ethnic dishes. Our restaurants were limited to a couple of greasy spoons, some (excellent) Mexican holes-in-the-wall, and a few (suspect) Chinese dives. I’m pretty sure that most would fail the county restaurant grading system that is implemented where I live now, but at the time, we quite enjoyed the fare they served there. My mom, a cultured sort who was raised in the city, did what she could to expose our palates to the more interesting side of culinary life with the few choices in our rural supermarkets. One of the benefits of living out in the boon docks, however, was easy access to farm-fresh meat and produce. My parents frequently bought meat from pastured cows, lambs and pigs from local ranchers before it was cool to be a locavore. Heck, the word locavore didn’t even exist. We had an extra freezer in our laundry room, where there were pounds and pounds of meat, shrink wrapped in individual packages. Lamb was a specialty of my mom’s and we feasted on garlic and rosemary stuffed roasted leg of lamb with mint jelly on holidays, and in summer, grilled lamb chops, generously sprinkled with garlic powder and salt. Her guests, sometimes avowed lamb haters, couldn’t help but succumb to its succulence. In all honesty, many didn’t realize they were eating lamb at all. After leaving home at 18 to go to college, I started eating my way around Los Angeles and discovered a true and abiding love for city living and ethnic food. One of my favorite discoveries was Middle Eastern and Indian food, specifically the way they prepared lamb. I couldn’t get enough of the searing heat in some dishes that was usually tempered with cooling yogurt sauces (and a cold beer). Served this way, the lamb was an earthy base upon which layers of complex flavors were built, spice by spice. When I had a kitchen of my own, I began experimenting with these exotic flavors, and my pantry soon filled with cumin, several varieties of dried chiles, corriander, fennel, garam masala and the like. I cooked lamb as often as we could afford it (which wasn’t much), with my husband acting as the ever-eager taste tester. Luckily, he too came from a family of lamb lovers. 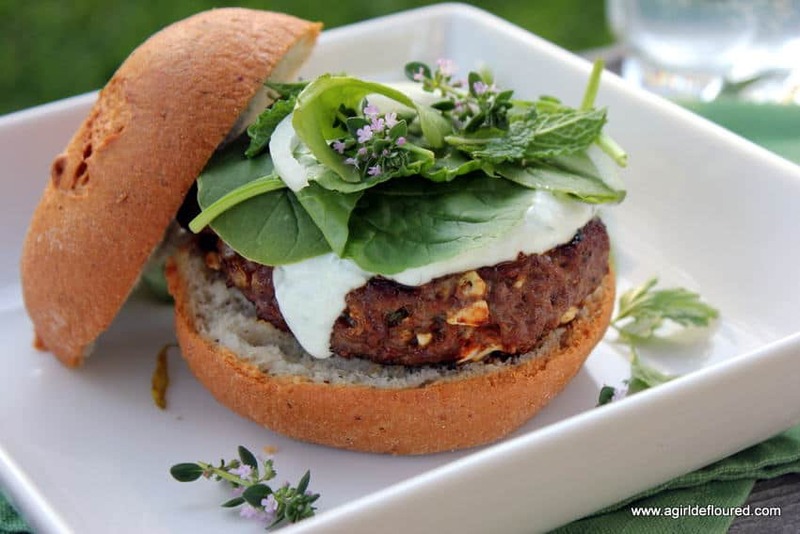 This recipe for lamb burgers is a riff on his mother’s recipe. In fact, his grandmother also made lamb burgers, and the kids were always tickled at how lamb burger rhymed with hamburger. His mom’s are studded throughout with fresh herbs and feta cheese. Mine are too, but with quite an added kick from ground chiles, smoked paprika and ground cumin. Drizzled with yogurt sauce, and topped with more fresh herbs, these are a unique twist on an American classic. 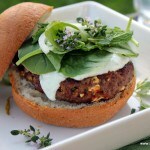 Serve these lamb burgers at your next cook out, with an ice cold Bard’s or New Planet on an Udi’s Gluten Free bun. Even the haters will love them. Heat a grill over medium-hot flames. Place lamb, shallot, herbs, spices, salt and pepper and feta cheese in a large mixing bowl. Mix together with your hands (or a fork) until evenly incorporated. Shape into four patties. Set aside. Mix ingredients for yogurt sauce and refrigerate until ready to use. Oil the grill and cook burgers for 5-7 minutes a side, or until done to your likeness. Serve immediately, drizzled with yogurt sauce and topped with additional fresh herbs like mint, thyme, or cilantro…and maybe a handful of baby spinach too. This entry was posted in Main Dishes, Recipes, Recipes & Techniques by Cooks We Love and tagged A Girl Defloured, Alison Needham, celiac disease, G-Free Foodie, gluten free cooking, gluten free diet, gluten free food, gluten free health. Bookmark the permalink.